This article is about the present-day legislature. For the building housing it, see Scottish Parliament Building. For the national legislature before 1707, see Parliament of Scotland. The Scottish Parliament (Scottish Gaelic: Pàrlamaid na h-Alba; Scots: Scots Pairlament) is the devolved unicameral legislature of Scotland. Located in the Holyrood area of the capital city, Edinburgh, it is frequently referred to by the metonym Holyrood. The Parliament is a democratically elected body comprising 129 members known as Members of the Scottish Parliament (MSPs), elected for four-year terms under the additional member system: 73 MSPs represent individual geographical constituencies elected by the plurality (‘first past the post’) system, while a further 56 are returned from eight additional member regions, each electing seven MSPs. The most recent general election to the Parliament was held on 5 May 2016, with the Scottish National Party winning a plurality. The original Parliament of Scotland was the national legislature of the independent Kingdom of Scotland, and existed from the early 13th century until the Kingdom of Scotland merged with the Kingdom of England under the Acts of Union 1707 to form the Kingdom of Great Britain. As a consequence, both the Parliament of Scotland and the Parliament of England ceased to exist, and the Parliament of Great Britain, which sat at Westminster in London was formed. Following a referendum in 1997, in which the Scottish electorate voted for devolution, the powers of the devolved legislature were specified by the Scotland Act 1998. The Act delineates the legislative competence of the Parliament – the areas in which it can make laws – by explicitly specifying powers that are "reserved" to the Parliament of the United Kingdom. The Scottish Parliament has the power to legislate in all areas that are not explicitly reserved to Westminster. The British Parliament retains the ability to amend the terms of reference of the Scottish Parliament, and can extend or reduce the areas in which it can make laws. The first meeting of the new Parliament took place on 12 May 1999. The competence of the Scottish Parliament has been amended numerous times since then, most notably by the Scotland Act 2012 and Scotland Act 2016, with some of the most significant changes being the expansion of the Parliament's powers, especially over taxation and welfare. Before the Treaty of Union 1707 united the Kingdom of Scotland and the Kingdom of England into a new state called "Great Britain", Scotland had an independent parliament known as the Parliament of Scotland. Initial Scottish proposals in the negotiation over the Union suggested a devolved Parliament be retained in Scotland, but this was not accepted by the English negotiators. For the next three hundred years, Scotland was directly governed by the Parliament of Great Britain and the subsequent Parliament of the United Kingdom, both seated at Westminster, and the lack of a Parliament of Scotland remained an important element in Scottish national identity. Suggestions for a 'devolved' Parliament were made before 1914, but were shelved due to the outbreak of the First World War. A sharp rise in nationalism in Scotland during the late 1960s fuelled demands for some form of home rule or complete independence, and in 1969 prompted the incumbent Labour government of Harold Wilson to set up the Kilbrandon Commission to consider the British constitution. One of the principal objectives of the commission was to examine ways of enabling more self-government for Scotland, within the unitary state of the United Kingdom. Kilbrandon published his report in 1973 recommending the establishment of a directly elected Scottish Assembly to legislate for the majority of domestic Scottish affairs. During this time, the discovery of oil in the North Sea and the following "It's Scotland's oil" campaign of the Scottish National Party (SNP) resulted in rising support for Scottish independence, as well as the SNP. The party argued that the revenues from the oil were not benefitting Scotland as much as they should. The combined effect of these events led to Prime Minister Wilson committing his government to some form of devolved legislature in 1974. However, it was not until 1978 that final legislative proposals for a Scottish Assembly were passed by the United Kingdom Parliament. Under the terms of the Scotland Act 1978, an elected assembly would be set up in Edinburgh provided that a referendum be held on 1 March 1979, with at least 40% of the total electorate voting in favour of the proposal. The 1979 Scottish devolution referendum failed: although the vote was 51.6% in favour of a Scottish Assembly, with a turnout of 63.6%, the majority represented only 32.9% of the eligible voting population. Throughout the 1980s and 1990s, demand for a Scottish Parliament grew, in part because the government of the United Kingdom was controlled by the Conservative Party, while Scotland itself elected relatively few Conservative MPs. In the aftermath of the 1979 referendum defeat, the Campaign for a Scottish Assembly was initiated as a pressure group, leading to the 1989 Scottish Constitutional Convention with various organisations such as Scottish churches, political parties and representatives of industry taking part. Publishing its blueprint for devolution in 1995, the Convention provided much of the basis for the structure of the Parliament. Devolution continued to be part of the platform of the Labour Party which, in May 1997, took power under Tony Blair. In September 1997, the Scottish devolution referendum was put to the Scottish electorate and secured a majority in favour of the establishment of a new devolved Scottish Parliament, with tax-varying powers, in Edinburgh. An election was held on 6 May 1999, and on 1 July of that year power was transferred from Westminster to the new Parliament. The public entrance of the Scottish Parliament building, opened in October 2004. Since September 2004, the official home of the Scottish Parliament has been a new Scottish Parliament Building, in the Holyrood area of Edinburgh. The Scottish Parliament building was designed by Spanish architect Enric Miralles in partnership with local Edinburgh Architecture firm RMJM which was led by Design Principal Tony Kettle. Some of the principal features of the complex include leaf-shaped buildings, a grass-roofed branch merging into adjacent parkland and gabion walls formed from the stones of previous buildings. Throughout the building there are many repeated motifs, such as shapes based on Raeburn's Skating Minister. Crow-stepped gables and the upturned boat skylights of the Garden Lobby, complete the unique architecture. Queen Elizabeth II opened the new building on 9 October 2004. In March 2006, one of the Holyrood building's roof beams slipped out of its support and was left dangling above the back benches during a debate. The debating chamber was subsequently closed, and MSPs moved to The Hub for one week, whilst inspections were carried out. During repairs, all chamber business was conducted in the Parliament's committee room two. 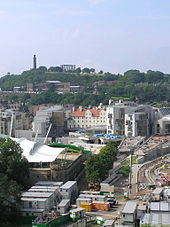 While the permanent building at Holyrood was being constructed, a temporary home for the Parliament was found in Edinburgh. The General Assembly Hall of the Church of Scotland on the Royal Mile was chosen to host the Parliament. Official photographs and television interviews were held in the courtyard adjoining the Assembly Hall, which is part of the School of Divinity of the University of Edinburgh. This building was vacated twice to allow for the meeting of the Church's General Assembly. In May 2000, the Parliament was temporarily relocated to the former Strathclyde Regional Council debating chamber in Glasgow, and to the University of Aberdeen in May 2002. After each election to the Scottish Parliament, at the beginning of each parliamentary session, Parliament elects one MSP to serve as Presiding Officer, the equivalent of the speaker in other legislatures, and two MSPs to serve as deputies. The Presiding Officer (currently Ken Macintosh) and deputies (currently Linda Fabiani and Christine Grahame) are elected by a secret ballot of the 129 MSPs, which is the only secret ballot conducted in the Scottish Parliament. Principally, the role of the Presiding Officer is to chair chamber proceedings and the Scottish Parliamentary Corporate Body. When chairing meetings of the Parliament, the Presiding Officer and his/her deputies must be politically impartial. During debates, the Presiding Officer (or the deputy) is assisted by the parliamentary clerks, who give advice on how to interpret the standing orders that govern the proceedings of meetings. A vote clerk sits in front of the Presiding Officer and operates the electronic voting equipment and chamber clocks. As a member of the Scottish Parliamentary Corporate Body, the Presiding Officer is responsible for ensuring that the Parliament functions effectively and has the staff, property and resources it requires to operate. Convening the Parliamentary Bureau, which allocates time and sets the work agenda in the chamber, is another of the roles of the Presiding Officer. Under the Standing Orders of the Parliament the Bureau consists of the Presiding Officer and one representative from each political party with five or more seats in the Parliament. Amongst the duties of the Bureau are to agree the timetable of business in the chamber, establish the number, remit and membership of parliamentary committees and regulate the passage of legislation (bills) through the Parliament. The Presiding Officer also represents the Scottish Parliament at home and abroad in an official capacity. The Presiding Officer controls debates by calling on members to speak. If a member believes that a rule (or standing order) has been breached, he or she may raise a "point of order", on which the Presiding Officer makes a ruling that is not subject to any debate or appeal. The Presiding Officer may also discipline members who fail to observe the rules of the Parliament. The Cabinet Secretary for Government Business and Constitutional Relations, supported by the Minister for Parliamentary Business, is responsible for steering the Scottish Government's executive business through Parliament. Seating in the debating chamber is arranged in a semicircle, with ministers sitting in the front section of the semicircle, directly opposite the presiding officer and parliamentary clerks. The debating chamber of the Scottish Parliament has seating arranged in a hemicycle, a design which is common across European legislatures, intended to encourage consensus and compromise. There are 131 seats in the debating chamber. Of the total 131 seats, 129 are occupied by the Parliament's elected MSPs and two are seats for the Scottish Law Officers—the Lord Advocate and the Solicitor General for Scotland, who are not elected members of the Parliament but are members of the Scottish Government. As such, the Law Officers may attend and speak in the plenary meetings of the Parliament but, as they are not elected MSPs, cannot vote. Members are able to sit anywhere in the debating chamber, but typically sit in their party groupings. The First Minister, Scottish cabinet ministers and Law officers sit in the front row, in the middle section of the chamber. The largest party in the Parliament sits in the middle of the semicircle, with opposing parties on either side. The Presiding Officer, parliamentary clerks and officials sit opposite members at the front of the debating chamber. In front of the Presiding Officers' desk is the parliamentary mace, which is made from silver and inlaid with gold panned from Scottish rivers and inscribed with the words: Wisdom, Compassion, Justice and Integrity. The words There shall be a Scottish Parliament, which are the first words of the Scotland Act, are inscribed around the head of the mace, which has a ceremonial role in the meetings of Parliament, representing the authority of the Parliament to make laws. Presented to the Scottish Parliament by the Queen upon Parliament's official opening in July 1999, the mace is displayed in a glass case, suspended from the lid. At the beginning of each sitting in the chamber, the lid of the case is rotated so that the mace is above the glass, to symbolise that a full meeting of the Parliament is taking place. 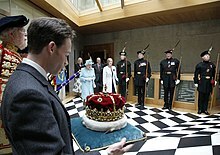 The Crown of Scotland is carried by The 16th Duke of Hamilton as Queen Elizabeth II leaves the Chamber, following the Opening of the fourth Session in July 2011. Parliament typically sits Tuesdays, Wednesdays and Thursdays from early January to late June and from early September to mid December, with two-week recesses in April and October. Plenary meetings in the debating chamber usually take place on Wednesday afternoons from 2 pm to 6 pm and on Thursdays from 9:15 am to 6 pm. Chamber debates and committee meetings are open to the public. Entry is free, but booking in advance is recommended due to limited space. Parliament TV is a webcast and archive of Parliamentary business back to 2012. and on the BBC's parliamentary channel BBC Parliament. Proceedings are also recorded in text form, in print and online, in the Official Report, which is the substantially verbatim transcript of parliamentary debates. Since September 2012, the first item of business on Tuesday afternoons is usually Time for Reflection at which a speaker addresses members for up to four minutes, sharing a perspective on issues of faith. This contrasts with the formal style of "Prayers", which is the first item of business in meetings of the House of Commons. Speakers are drawn from across Scotland and are chosen to represent the balance of religious beliefs according to the Scottish census. Invitations to address Parliament in this manner are determined by the Presiding Officer on the advice of the parliamentary bureau. Faith groups can make direct representations to the Presiding Officer to nominate speakers. Before September 2012, Time for reflection was held on Wednesday afternoons. The Presiding Officer (or Deputy Presiding Officer) decides who speaks in chamber debates and the amount of time for which they are allowed to speak. Normally, the Presiding Officer tries to achieve a balance between different viewpoints and political parties when selecting members to speak. Typically, ministers or party leaders open debates, with opening speakers given between 5 and 20 minutes, and succeeding speakers allocated less time. The Presiding Officer can reduce speaking time if a large number of members wish to participate in the debate. Debate is more informal than in some parliamentary systems. Members may call each other directly by name, rather than by constituency or cabinet position, and hand clapping is allowed. Speeches to the chamber are normally delivered in English, but members may use Scots, Gaelic, or any other language with the agreement of the Presiding Officer. The Scottish Parliament has conducted debates in the Gaelic language. Each sitting day, normally at 5 pm, MSPs decide on all the motions and amendments that have been moved that day. This "Decision Time" is heralded by the sounding of the division bell, which is heard throughout the Parliamentary campus and alerts MSPs who are not in the chamber to return and vote. At Decision Time, the Presiding Officer puts questions on the motions and amendments by reading out the name of the motion or amendment as well as the proposer and asking "Are we all agreed? ", to which the chamber first votes orally. If there is audible dissent, the Presiding Officer announces "There will be a division" and members vote by means of electronic consoles on their desks. Each MSP has a unique access card with a microchip which, when inserted into the console, identifies them and allows them to vote. As a result, the outcome of each division is known in seconds. The outcome of most votes can be predicted beforehand since political parties normally instruct members which way to vote. Parties entrust some MSPs, known as whips, with the task of ensuring that party members vote according to the party line. MSPs do not tend to vote against such instructions, since those who do are unlikely to reach higher political ranks in their parties. Errant members can be deselected as official party candidates during future elections, and, in serious cases, may be expelled from their parties outright. Thus, as with many Parliaments, the independence of Members of the Scottish Parliament tends to be low, and backbench rebellions by members who are discontent with their party's policies are rare. In some circumstances, however, parties announce "free votes", which allows Members to vote as they please. This is typically done on moral issues. Immediately after Decision Time a "Members Debate" is held, which lasts for 45 minutes. Members Business is a debate on a motion proposed by an MSP who is not a Scottish minister. Such motions are on issues which may be of interest to a particular area such as a member's own constituency, an upcoming or past event or any other item which would otherwise not be accorded official parliamentary time. As well as the proposer, other members normally contribute to the debate. The relevant minister, whose department the debate and motion relate to "winds up" the debate by speaking after all other participants. Private Bill Committees are set up to deal with the legislation required for major public sector infrastructure projects, such as the underground extensions to the National Gallery of Scotland in 2003. Much of the work of the Scottish Parliament is done in committee. The role of committees is stronger in the Scottish Parliament than in other parliamentary systems, partly as a means of strengthening the role of backbenchers in their scrutiny of the government and partly to compensate for the fact that there is no revising chamber. The principal role of committees in the Scottish Parliament is to take evidence from witnesses, conduct inquiries and scrutinise legislation. Committee meetings take place on Tuesday, Wednesday and Thursday morning when Parliament is sitting. Committees can also meet at other locations throughout Scotland. Committees comprise a small number of MSPs, with membership reflecting the balance of parties across Parliament. There are different committees with their functions set out in different ways. Mandatory Committees are committees which are set down under the Scottish Parliament's standing orders, which govern their remits and proceedings. The current Mandatory Committees in the fourth Session of the Scottish Parliament are: Public Audit; Equal Opportunities; European and External Relations; Finance; Public Petitions; Standards, Procedures and Public Appointments; and Delegated Powers and Law Reform. Subject Committees are established at the beginning of each parliamentary session, and again the members on each committee reflect the balance of parties across Parliament. Typically each committee corresponds with one (or more) of the departments (or ministries) of the Scottish Government. The current Subject Committees in the fourth Session are: Economy, Energy and Tourism; Education and Culture; Health and Sport; Justice; Local Government and Regeneration; Rural Affairs, Climate Change and Environment; Welfare Reform; and Infrastructure and Capital Investment. A further type of committee is normally set up to scrutinise private bills submitted to the Scottish Parliament by an outside party or promoter who is not a member of the Scottish Parliament or Scottish Government. Private bills normally relate to large-scale development projects such as infrastructure projects that require the use of land or property. Private Bill Committees have been set up to consider legislation on issues such as the development of the Edinburgh Tram Network, the Glasgow Airport Rail Link, the Airdrie-Bathgate Rail Link and extensions to the National Gallery of Scotland. The Scotland Act 1998, which was passed by the Parliament of the United Kingdom and given royal assent by Queen Elizabeth II on 19 November 1998, governs the functions and role of the Scottish Parliament and delimits its legislative competence. The Scotland Act 2012 and the Scotland Act 2016 extended the devolved competencies. For the purposes of parliamentary sovereignty, the Parliament of the United Kingdom at Westminster continues to constitute the supreme legislature of Scotland. However, under the terms of the Scotland Acts, Westminster agreed to devolve some of its responsibilities over Scottish domestic policy to the Scottish Parliament. Such "devolved matters" include education, health, agriculture and justice. The Scotland Act 1998 enabled the Scottish Parliament to pass primary legislation on these issues. A degree of domestic authority, and all foreign policy, remain with the UK Parliament in Westminster. The Scottish Parliament has the power to pass laws and has tax powers. Another of the roles of the Parliament is to hold the Scottish Government to account. The specific devolved matters are all subjects which are not explicitly stated in Schedule 5 to the Scotland Act as reserved matters. All matters that are not specifically reserved are automatically devolved to the Scottish Parliament. Most importantly, this includes agriculture, fisheries and forestry, economic development, education, environment, food standards, consumer advocacy, health, home affairs, legal system, courts, legal profession, police and fire services, prisons, control of air guns, local government, sport and the arts, many aspects of transport (including rail franchising), training, tourism, research and statistics, social work, and some powers over social security. In terms of tax powers, the Scottish Parliament has full control over income tax rates and thresholds on all non-savings and non-dividend income liable for tax by taxpayers resident in Scotland. The Scottish Parliament also has full control over Land and Buildings Transaction Tax and Scottish Landfill Tax. Reserved matters are subjects that are outside the legislative competence of the Scotland Parliament. The Scottish Parliament is unable to legislate on such issues that are reserved to, and dealt with at, Westminster (and where Ministerial functions usually lie with UK Government ministers). These include broadcasting policy, civil service, common markets for UK goods and services, constitution, electricity, coal, oil, gas, nuclear energy, defence and national security, drug policy, employment, foreign policy and relations with Europe, welfare, reserved tax powers, most aspects of transport safety and regulation, National Lottery, protection of borders, most aspects of social security and stability of UK's fiscal, economic and monetary system. Members of the public take part in Parliament in two ways that are not the case at Westminster: a public petitioning system, and cross-party groups on policy topics which the interested public join and attend meetings of, alongside MSPs. The Parliament is able to debate any issue (including those reserved to Westminster) but is unable to make laws on issues that are outside its legislative competence. After a bill has passed through all legislative stages, it becomes an Act of the Scottish Parliament. As the Scottish Parliament is able to make laws on the areas constitutionally devolved to it, the legislative process begins with bills (draft laws) which are presented to Parliament. 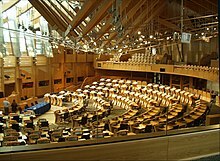 Bills can be introduced to Parliament in a number of ways; the Scottish Government can introduce new laws or amendments to existing laws as a bill; a committee of the Parliament can present a bill in one of the areas under its remit; a member of the Scottish Parliament can introduce a bill as a private member; or a private bill can be submitted to Parliament by an outside proposer. Most draft laws are government bills introduced by ministers in the governing party (or parties). Bills pass through Parliament in a number of stages before receiving royal assent, whereupon they become Acts of the Scottish Parliament. The result for the Kelvin constituency being declared at the Scottish Parliament election, 2007. Ordinary general elections for the Scottish Parliament are held on the first Thursday in May every four years. The party, or parties, that hold the majority of seats in the Parliament forms the Scottish Government. In contrast to many other parliamentary systems, Parliament elects a First Minister from a number of candidates at the beginning of each parliamentary term (after a general election). Any member can put their name forward to be First Minister, and a vote is taken by all members of Parliament. Normally, the leader of the largest party is returned as First Minister, and head of the Scottish Government. Theoretically, Parliament also elects the Scottish Ministers who form the government of Scotland and sit in the Scottish cabinet, but such ministers are, in practice, appointed to their roles by the First Minister. Junior ministers, who do not attend cabinet, are also appointed to assist Scottish ministers in their departments. Most ministers and their juniors are drawn from amongst the elected MSPs, with the exception of Scotland's Chief Law Officers: the Lord Advocate and the Solicitor General. Whilst the First Minister chooses the ministers – and may decide to remove them at any time – the formal appointment or dismissal is made by the Sovereign. Under the Scotland Act 1998, ordinary general elections for the Scottish Parliament are held on the first Thursday in May every four years (1999, 2003, 2007 and so on). The date of the poll may be varied by up to one month either way by the Monarch on the proposal of the Presiding Officer. If the Parliament itself resolves that it should be dissolved (with at least two-thirds of the Members voting in favour), or if the Parliament fails to nominate one of its members to be First Minister within 28 days of a General Election or of the position becoming vacant, the Presiding Officer proposes a date for an extraordinary general election and the Parliament is dissolved by the Queen by royal proclamation. Extraordinary general elections are in addition to ordinary general elections, unless held less than six months before the due date of an ordinary general election, in which case they supplant it. The following ordinary election reverts to the first Thursday in May, a multiple of four years after 1999 (i.e., 5 May 2011, 7 May 2015, etc.). Several procedures enable the Scottish Parliament to scrutinise the Government. The First Minister or members of the cabinet can deliver statements to Parliament upon which MSPs are invited to question. For example, at the beginning of each parliamentary year, the First Minister delivers a statement to the chamber setting out the Government's legislative programme for the forthcoming year. After the statement has been delivered, the leaders of the opposition parties and other MSPs question the First Minister on issues related to the substance of the statement. Parliamentary time is also set aside for question periods in the debating chamber. A "General Question Time" takes place on a Thursday between 11:40 a.m. and noon where members can direct questions to any member of the Scottish Government. At 2:30 pm, a 40-minute-long themed "Question Time" takes place, where members can ask questions of ministers in departments that are selected for questioning that sitting day, such as health and justice or education and transport. Between noon and 12:30 p.m. on Thursdays, when Parliament is sitting, First Minister's Question Time takes place. This gives members an opportunity to question the First Minister directly on issues under their jurisdiction. Members who wish to ask general or themed questions, or questions of the First Minister, must lodge them with parliamentary clerks beforehand and selections are made by the Presiding Officer. Written questions may also be submitted by members to ministers. Written questions and answers are published in the Official Report. Elections for the Scottish Parliament were amongst the first in Britain to use a mixed member proportional representation (MMP) system. The system is a form of the additional member method (AMS) of proportional representation, and is better known as such in Britain. Under the system, voters are given two votes: one for a specific candidate and one for a political party. Of the 129 MSPs, 73 are elected to represent first past the post constituencies and are known as "Constituency MSPs". Voters choose one member to represent the constituency, and the member with most votes is returned as a constituency MSP. The 73 Scottish Parliament constituencies shared the same boundaries as the UK Parliament constituencies in Scotland, prior to the 2005 reduction in the number of Scottish MPs, with the exception of Orkney and Shetland which each return their own constituency MSP. Currently, the average Scottish Parliament constituency comprises 55,000 electors. Given the geographical distribution of population in Scotland, this results in constituencies of a smaller area in the Central Lowlands, where the bulk of Scotland's population live, and much larger constituency areas in the north and west of the country, which have a low population density. The island archipelagos of Orkney, Shetland and the Western Isles comprise a much smaller number of electors, due to their dispersed population. If a Constituency MSP resigns from Parliament, this triggers a by-election in his or her constituency, where a replacement MSP is returned from one of the parties by the plurality system. Each political party draws up a list of candidates standing in each electoral region, from which the List MSPs are elected. When a List MSP resigns, the next person on the resigning MSPs' party's list takes the seat. The total number of seats in the Parliament are allocated to parties proportionally to the number of votes received in the second vote of the ballot using the d'Hondt method. For example, to determine who is awarded the first list seat, the number of list votes cast for each party is divided by one plus the number of seats the party won in the region (at this point just constituency seats). The party with the highest quotient is awarded the seat, which is then added to its constituency seats in allocating the second seat. This is repeated iteratively until all available list seats are allocated. As the allocation of seats to parties mirrors the popular vote, it is commonplace for the most successful party in the election not to win an outright majority of the seats, thereby requiring them to seek some form and level of cross-party support for their initiatives in government. Nonetheless, the 2011 election saw the SNP become the first–and to date, only–party to win a majority government. As in the House of Commons, a number of qualifications apply to being an MSP. Such qualifications were introduced under the House of Commons Disqualification Act 1975 and the British Nationality Act 1981. Specifically, members must be over the age of 18 and must be a citizen of the United Kingdom, the Republic of Ireland, one of the countries in the Commonwealth of Nations, a citizen of a British overseas territory, or a European Union citizen resident in the UK. Members of the police and the armed forces are disqualified from sitting in the Scottish Parliament as elected MSPs, and similarly, civil servants and members of foreign legislatures are disqualified. An individual may not sit in the Scottish Parliament if he or she is judged to be insane under the terms of the Mental Health (Care and Treatment) (Scotland) Act 2003. There have been five elections to the Parliament, in 1999, 2003, 2007, 2011 and 2016. The next Scottish Parliament election is due to be held on Thursday 6 May 2021. Under the Scotland Act 1998, an ordinary general election to the Scottish Parliament would normally have been held on the first Thursday in May four years after the 2016 election, i.e. in May 2020. This would have clashed with the proposed date of the 2020 United Kingdom general election, but later became a moot point after the latter was brought forward to 2017. In November 2015, the Scottish Government published a Scottish Elections (Dates) Bill, which proposed to extend the term of the Parliament to five years. That Bill was passed by the Scottish Parliament on 25 February 2016 and received Royal Assent on 30 March 2016, setting the new date for the election as 6 May 2021, with subsequent elections every four years after that. As with all elections in the UK, Irish and qualifying Commonwealth citizens are entitled to vote. Unlike elections to the Westminster parliament, citizens of other non-Commonwealth EU member states who are resident in Scotland are entitled to vote in elections to the Scottish Parliament. Overseas electors on Scottish electoral registers are not allowed to vote in Scottish Parliament elections. From the 2016 election, the franchise for Scottish Parliament elections was expanded to include 16 and 17-year olds. For criticisms of the Scottish Parliament Building, see Scottish Parliament Building § Controversy. Enric Miralles' Scottish Parliament complex in Holyrood Park during construction. The building was completed in 2004. Above and behind the new Scottish Parliament is the neoclassical Old Royal High School, which was prepared for a previous devolved assembly, but never used. The resignation of Henry McLeish as First Minister, brought on by an office expenses scandal, generated controversy in the first years of the Scottish Parliament. Various academics have written on how the Scottish Parliament can be improved as a governing institution. A procedural consequence of the establishment of the Scottish Parliament is that Scottish MPs sitting in the UK House of Commons have been able to vote on domestic legislation that applies only to England, Wales, and Northern Ireland – whilst English, Scottish, Welsh and Northern Irish Westminster MPs are unable to vote on the domestic legislation of the Scottish Parliament. This phenomenon is known as the West Lothian question and has led to criticism. Following the Conservative victory in the 2015 UK election, standing orders of the House of Commons were changed to give MPs representing English constituencies a new "veto" over laws only affecting England, known as English votes for English laws. ^ a b "Nicola Sturgeon rules out coalition after 'emphatic' win for SNP". BBC News. 6 May 2016. Retrieved 6 May 2016. ^ "Scottish Elections (Dates) Act 2016" (PDF). Scottish Parliament. 30 March 2016. Retrieved 6 May 2016. ^ "Makkin Yer Voice Heard in the Scottish Pairlament". Scottish Parliament. Archived from the original on 3 November 2007. Retrieved 10 February 2007. ^ "SPCB Leid Policy" (PDF). Scottish Parliament. Retrieved 10 February 2007. ^ The Scots for Scottish is in fact Scots. ^ "Scottish Parliament Word Bank". Scottish Parliament. Archived from the original on 3 December 2005. Retrieved 14 November 2006. ^ a b "How the Scottish Parliament works" (PDF). Scottish Parliament. October 2014. Retrieved 1 July 2016. ^ a b "The Scottish Parliament – Past and Present" (PDF). Scottish Parliament. Archived from the original (PDF) on 20 August 2016. Retrieved 1 July 2016. ^ "Scotland Act 1998: Scottish Parliament Reserved Issues". Office of Public Sector Information (OPSI). Archived from the original on 19 May 2007. Retrieved 14 November 2006. ^ Murkens, Jones & Keating (2002), p. 11. ^ "Scottish Parliament Official Report – 12 May 1999". Scottish Parliament. Retrieved 5 November 2006. ^ "The Last Parliament of Scotland 1703–1707". BBC. 1997. Retrieved 15 October 2006. ^ a b c d e f g h "The Devolution Debate (1997) – This Century". BBC. Retrieved 13 October 2006. ^ "Papers reveal devolution warnings". BBC News. 1 January 2005. Retrieved 24 November 2006. ^ "The 1979 Referendums". The Holyrood Inquiry. 1997. Retrieved 21 August 2006. ^ Peter Fraser (15 October 2004). "Events Prior to 1 May 1997". The Holyrood Inquiry. Archived from the original on 24 October 2004. Retrieved 17 November 2006. ^ "Past Referendums – Scotland 1997". The Electoral Commission. Archived from the original on 7 December 2006. Retrieved 17 November 2006. ^ Morgan, Bryn (8 October 1999). "House of Commons Research Paper – Scottish Parliament Elections: 6 May 1999". House of Commons Library. Retrieved 2 July 2016. ^ Charles Jencks (January 2005). "Identity parade: Miralles and the Scottish parliament: On the architectural territories of the EMBT/RMJM parliament building". Architecture Today no.154 p.32–44. Archived from the original on 9 October 2007. Retrieved 7 January 2007. ^ "Gallery – The Scottish Parliament at Holyrood". The Guardian. London. Retrieved 25 October 2006. ^ "Holyrood business halted by beam". BBC News. BBC. 2 March 2006. Retrieved 16 August 2017. ^ "MSPs face further beam disruption". BBC News. 9 March 2006. Retrieved 16 October 2006. ^ Sengupta, Kim (21 March 1998). "Parliament kept out in double blow for Glasgow". The Independent. Retrieved 4 March 2017. ^ "Kirk's home hosts moment of history". BBC News. 1 July 1999. Retrieved 14 November 2006. ^ "Glasgow's miles better for parliament". BBC News. 13 January 2000. Retrieved 4 March 2017. ^ Urquhart, Frank (12 September 2001). "Aberdeen first city outside central belt to host parliament". The Scotsman. Retrieved 4 March 2017. ^ "About the Parliament: The Presiding Officer". Scottish Parliament. Retrieved 1 July 2016. ^ a b c d "About the Parliament: The Presiding Officer: The Presiding Officer". Scottish Parliament. Retrieved 1 July 2016. ^ a b c d e f g h i "The Scottish Parliament Debating Chamber" (PDF). Scottish Parliament. Archived from the original (PDF) on 29 October 2006. Retrieved 13 October 2006. ^ "About the Parliament: Corporate Governance: Scottish Parliamentary Corporate Body (SPCB): SPCB Remit". Scottish Parliament. Retrieved 1 July 2016. ^ "Horseshoe chamber shapes up Dewar says Scottish parliament design will not follow the confrontational template of Westminster". The Herald. 22 November 1997. Retrieved 3 March 2017. ^ Lockhart, David (19 February 2014). "Westminster and Holyrood: A tale of two parliaments". BBC News. Retrieved 25 February 2017. ^ a b "A symbol of authority". BBC News. 1 July 1999. ^ a b c "Parliament Mace to go on display at the Museum of Scotland". Scottish Parliament. 15 July 1999. Archived from the original on 7 September 2006. Retrieved 12 October 2006. ^ "Donald Dewar's speech at the opening of the Scottish Parliament 1 July 1999" (PDF). Scottish Parliament. Retrieved 23 June 2016. ^ a b c d e f g "Issue Briefs – Scottish Parliament guide". Politics.co.uk. Archived from the original on 27 September 2007. Retrieved 16 October 2006. ^ "Parliament TV: Home". scottishparliament.tv. Retrieved 30 September 2016. ^ "Official Report terms of Reference". Parliamentary Business: Official Report: About the Official Report. Scottish Parliament. Retrieved 1 July 2016. ^ a b c "Contributors to Time for Reflection – Session 4" (PDF). Scottish Parliament. Retrieved 1 July 2016. ^ Burrows, N. (1999), pp. 241–260. ^ "Standing Orders of the Scottish Parliament: Chapter 7: Conduct of Meetings". Scottish Parliament. Retrieved 1 July 2016. ^ "Scottish Parliament Corporate Body". Scottish Parliament Language Policy. Scottish Parliament. 2004. Archived from the original on 3 September 2006. Retrieved 11 October 2006. ^ "Scottish Parliament Corporate Body". Scottish Parliament-Parliamentary Business. Scottish Parliament. 29 February 2000. Archived from the original on 14 November 2005. Retrieved 11 October 2006. ^ "Evidence from the Minister for Parliamentary Business – Scottish Parliament". Richard Commission. 12 February 2003. Retrieved 14 November 2006. ^ Kingdom, J. (1999), p. 373. ^ a b Kingdom, J. (1999), p. 374. ^ Kingdom, J. (1999), p. 375. ^ Dardanelli (2005), p. 185. ^ a b c d "The Scottish Parliament Committees". Scottish Parliament. Retrieved 1 July 2016. ^ "Finance Committee to meet in Perth". Scottish Parliament Information Centre (SPICe). Archived from the original on 21 March 2005. Retrieved 22 November 2006. ^ "Scottish Parliament committees – what are they and what do they do?" (PDF). Scottish Parliament. December 2014. Retrieved 1 July 2016. ^ a b "Bills explained: Private Bills". Scottish Parliament. Retrieved 1 July 2016. ^ "Scotland Act preamble". Office of Public Sector Information (OPSI). Archived from the original on 19 May 2007. Retrieved 14 November 2006. ^ "Scotland's Parliament – powers and structures". BBC News. 8 April 1999. ^ a b "Devolution: UK Parliament". Scotland Office. Archived from the original on 4 October 2006. Retrieved 14 November 2006. ^ a b c d e "Reserved and devolved matters". Scotland Office. Archived from the original on 4 October 2006. Retrieved 14 November 2006. ^ a b "Devolution to Scotland". BBC. 14 October 2002. Retrieved 14 November 2006. ^ "Income tax powers officially devolved to Holyrood". BBC. 30 October 2016. ^ Douglas Fraser (2 February 2016). "Scotland's tax powers: What it has and what's coming?". BBC News. Retrieved 2 February 2016. ^ "How the Scottish Parliament will work". Law Society of Scotland. Archived from the original on 4 October 2006. Retrieved 14 November 2006. ^ a b "Parliamentary Business: Bills: Bills Explained". Scottish Parliament. Retrieved 15 December 2016. ^ "Bills: Bills Explained: Public, Private & Hybrid Bills Guidance: Guidance on Public Bills: Part 2: Stages of Bills – the general rules". Scottish Parliament. Retrieved 15 December 2016. ^ a b "Making Your Voice Heard". Scottish Parliament. Archived from the original on 11 December 2007. Retrieved 16 November 2007. ^ a b "A Guide to Other Early Business of the Scottish Parliament, including Selection of a Nominee for Appointment as First Minister". Scottish Parliament. Archived from the original on 1 November 2005. Retrieved 14 November 2006. ^ a b "Scotland Act 1998 – Section 2 Ordinary General Elections". Office of Public Sector Information (OPSI). Archived from the original on 19 May 2007. Retrieved 14 November 2006. ^ "Scotland Act 1998 – Section 46 Choice of the First Minister". Office of Public Sector Information (OPSI). Archived from the original on 31 October 2007. Retrieved 10 May 2007. ^ "Scotland Act 1998 – Section 3 Extraordinary General Elections". Office of Public Sector Information (OPSI). Archived from the original on 19 May 2007. Retrieved 14 November 2006. ^ Jack McConnell. "Statement by First Minister on the government's Legislative Programme". Scottish Government. Archived from the original on 17 November 2017. Retrieved 14 November 2006. ^ "Debate on Scottish Government's Programme". Scottish Parliament Official Report, 6 September 2005. Archived from the original on 3 July 2007. Retrieved 14 November 2006. ^ a b "Scottish Parliament and Scottish Executive". Scotland Office. Archived from the original on 4 October 2006. Retrieved 8 November 2006. ^ a b "Close of Consultation on Scottish Parliament size". Scotland Office. 2 April 2002. Archived from the original on 4 October 2006. Retrieved 17 October 2006. ^ "MSPs". Scottish Parliament. Retrieved 17 October 2006. ^ a b "Electoral System – How it works". BBC. 2 April 2003. Retrieved 22 October 2006. ^ "Labour loses out in key Marginals". BBC. 6 May 2005. Retrieved 14 November 2006. ^ "Electoral Administration Act 2006" (PDF). Department for Constitutional Affairs (DCA). Retrieved 6 February 2007. The Electoral Administration Act 2006, reduced the age of candidacy in the United Kingdom from 21 to 18. ^ a b c "Scotland Act 1998, Section 15, Disqualification from membership of Parliament". Office of Public Sector Information (OPSI). Archived from the original on 25 May 2007. Retrieved 1 November 2006. ^ a b "Scottish Elections (Dates) Act 2016". legislation.gov.uk. Retrieved 7 May 2016. ^ "Scotland Act 1998 – Section 2 Ordinary General Elections". Office of Public Sector Information. Retrieved 8 May 2007. ^ a b "Scottish Elections (Dates) Bill published" (Press release). Scottish Government. 18 November 2015. Archived from the original on 4 June 2016. Retrieved 6 May 2016. ^ "Registering to vote and the electoral register". Electoral Commission. 10 June 2014. Retrieved 22 July 2014. ^ "Cut in Scottish voting age passed unanimously". BBC News. 18 June 2015. Retrieved 8 May 2016. ^ "Text of Henry McLeish's resignation speech to the Scottish Parliament". The Guardian. London. 9 November 2001. Retrieved 14 November 2006. ^ David McCrone (8 April 2003). "Peeblin' Wi' Stanes: Assessing the Scottish Parliament, 1999–2003". Institute of Governance. Archived from the original on 22 October 2006. Retrieved 14 October 2006. ^ Paul Cairney (13 May 2013). "How Can the Scottish Parliament Be Improved as a Legislature". Scottish Parliamentary Review. ^ Oonagh Gay (26 June 2007). "The West Lothian Question" (PDF). House of Commons Research Paper. Archived from the original (PDF) on 2 January 2007. Retrieved 9 February 2007. ^ "New 'veto' announced for English MPs". BBC News. 2 July 2015. Retrieved 4 July 2015.